Here comes MJX Bugs new family member: B3pro! A super cool drone which is exactly the beginner drone that you need. With the special appearance, you will love it at the first sight. 2.4GHZ Two-way Communication: New generation two-way 2.4GHZ remote control to enhance distance control of the transmitter to 600-800 meters for the ultimate flying experience. High Capacity Battery: Fly up to about 22 minutes on a single charge, using the included 2800mAh battery. Brushless Devices: 2204 1500KV brushless motor and 4in1 8A brushless ESC guarantee a strong flying performance. GPS positioning and altitude hold: Provide a stable and accurate fly experience. 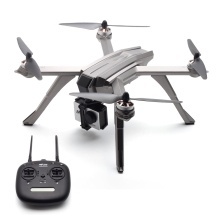 C6000 5G Wifi transmission 1080P HD camera: Bring with you the most exciting aerial photographing experience. Geofence: Geofence is a virtual barrier that you define preventing the drone from flying out of a designated zone. Follow Me: enables you to stay in the heart of the action at all times. B3PRO films you on the go without anyone piloting the drone directly. This product is not suitable for children under 14 years old.Please read the introduction carefully before you start to operate.